Roberta Gately's lyrical and authentic debut novel--inspired by her own experiences as a nurse in third world war zones--is one woman's moving story of offering help and finding hope in the last place she expected. Gripped by haunting magazine images of starving refugees, Elsa has dreamed of becoming a nurse since she was a teenager. Of leaving her humble working-class Boston neighborhood to help people whose lives are far more difficult than her own. No one in her family has ever escaped poverty, but Elsa has a secret weapon: a tube of lipstick she found in her older sister's bureau. Wearing it never fails to raise her spirits and cement her determination. 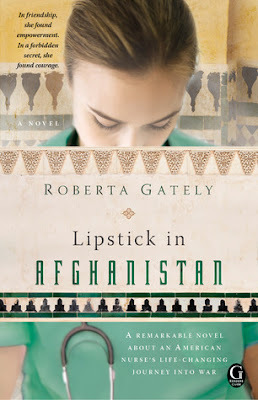 With lipstick on, she can do anything--even travel alone to war-torn Afghanistan in the wake of 9/11. When I read the back of this book I knew I would love it. This was such a great story that was well written, especially for being a first novel. Roberta Gately has gained a new fan and I look forward to reading more from her. Not only could I picture everything that was happening, but I felt connected with the main character, Elsa. The fact that she went to another country to help others and not only helped them, but helped herself as well. Her character is very sweet and in some ways innocent in the beginning, but by the end of the book her character grows so much and is strong, independent and has so much courage. Another part of the book I loved was the friendship between both Elsa and Parween. They are two different women from two different worlds who connect and become best friends. That made this book even harder to put down. I read this book from beginning to cover while I was on my plane trip to California last month and I still talk about it to a few friends of mine. If I didn't have a family to take care of I would love to travel to another country to help those in need. I do hope to do that with my children and husband one day once they're a bit older. A great book that deserves to be read by all! Disclosure: All opinions are my own. I received Lipstick in Afghanistan at no cost for the purpose of this review. No other compensation was received.